In autumn 2016 the Chartered Institute of Linguists (CIOL) collaborated with the European Commission Representation in the UK and the Institute of Translation and Interpreting (ITI) to conduct a survey of UK translation professionals. Almost 600 people responded, covering the full spectrum of translation activity. The results of the survey create a picture of the UK's translation sector and offer a snapshot of sentiment across a wide range of issues, with an additional focus on the use of translation tools and technologies. The survey grew out of work organised under the #TranslatingEurope initiative led by the Commission's Directorate-General for Translation. The report of the survey results was launched at Europe House on Thursday 11 May. 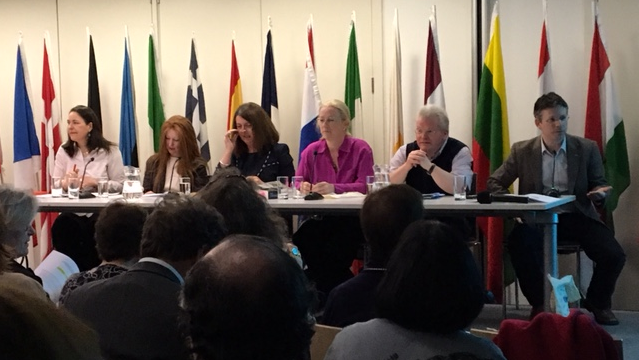 A panel of senior practitioners led a lively debate on some of the survey findings, covering the role of professional associations, remuneration for translation work and the impact of technology on the future of human translators. The full report, including an appendix with full verbatim responses to all questions in the survey, can be found here. The survey organisers welcome any comments or suggestions on the survey and the report, in particular as to whether, how and when the survey should be repeated. Please e-mail these to DGT-LONDON@ec.europa.eu. Findings from the report may be quoted freely, provided these are attributed to the 2016 UK Translator Survey organised by the European Commission, the CIOL and the ITI. On social media please use the hashtags #2016UKTranslatorSurvey and #TranslatingEurope.